Electrical Mechanical, Assistant Grade III, AG II, Steno Grade 2 and Typist Hindi Jobs. Candidates who are qualified Diploma or Degree in any engineering or BSc or BCom they are eligible to apply online for this FCI JE Steno Typist Posts. Online link will be active from 23-02-2019. Last date to apply online this FCI JE Steno Typist Posts is 25-03-2019. Computer Based online Test will be held for FCI JE CMS Assistant Grade III Posts recruitment 2019 in two phases. 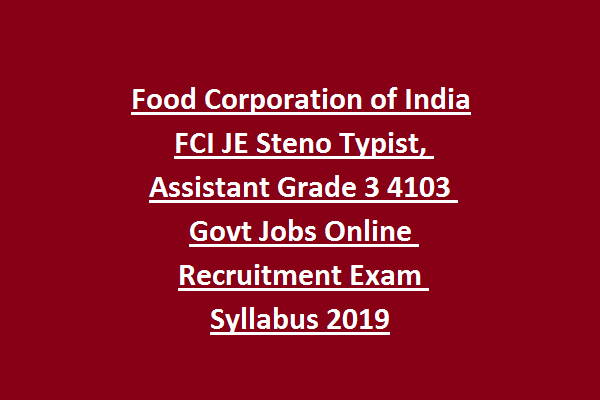 FCI JE Exam Pattern and, FCI Steno Typist Syllabus, Post wise vacancies, Zone wise vacancies, FCI JE Exam Date for this FCI JE Steno Typist Recruitment Exam 2019 Notification is updated below. There are total 4103 Posts are available in this Food Corporation of India Recruitment 2019. Post name and no of vacancies are updated below. Typist Hindi: Degree with Hindi Typing Knowledge of 30 WPM. Assistant Grade 3, AG 2: Degree qualification is required. Candidates selection will be based on two phases for this FCI jobs recruitment. Phase 1 Written exam will be conducted for 100 Marks for this Food Corporation of India. Phase 2 Exam will be conducted for 360 Marks for AG III General, AG III Depot, Typist hindi and Steno Grade II posts. For all other posts Phase 2 exam consists of 2 papers only. Written Exam will be conducted in two phases. FCI Phase 1 exam will be conducted for 100 marks and total 100 questions will be given. Each question carries one mark. Exam Duration for FCI Phase 1 is 60 minutes. 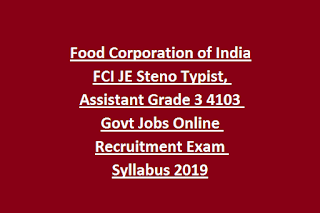 Those who are looking for this JE, AG II, Steno Typist and Assistant Grade III vacancies they can apply online through FCI website of their respective region. Last date to apply online is 25-01-2019.